On July 3, 1958, Lord Lanto was succeeded by the ascended master Confucius as hierarch of the Royal Teton Retreat. On that date also, Lord Lanto, with attainment far beyond that required either of retreat hierarch or chohan, accepted the office of lord of the second ray from Kuthumi. This blessed brother, who had worshiped the God of Peace as Saint Francis, had already joined Jesus in the office of World Teacher in 1956. 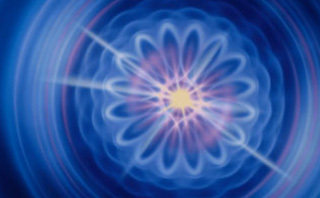 On October 30, 1966, in cooperation with the God and Goddess Meru, Lanto was granted the dispensation by the Karmic Board for a “mighty transcendent golden flame of illumination” to pulsate three hundred feet into the atmosphere over the colleges, universities, divinity and theological schools of America and the world whose students and faculty were and would be receptive to knowledge from higher spheres. The ascended master Lanto conducts classes at the Royal Teton Retreat, the initial retreat of the Great White Brotherhood to where we may ask to be taken in our etheric body at night. Here we learn the fundamentals of the path of initiation. Because of the dispensation of opening the seven retreats of the seven chohans, many tens of thousands of souls are receiving training at inner levels to accelerate their consciousness for the New Age. Lord Lanto, the Sage, Master of Precipitation. Lord Lanto is a master of the power of precipitation—the alchemical process of drawing forth cosmic light and substance from the universal substance and coalescing it into physical form, often by using the Science of the Spoken Word. 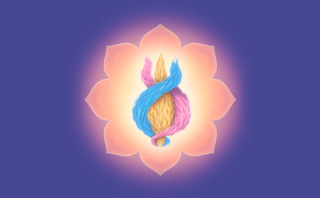 Having studied under Lord Himalaya and gained his mastery in the Retreat of the Blue Lotus, Lord Lanto elected to use the yellow plume to enfold the hearts of all mankind. 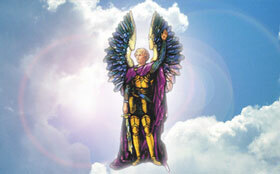 He is dedicated to the perfectionment of the evolutions of this planet through Cosmic Christ illumination. The golden flame that he bears is charged with the momentum of God-victory for the youth of the world. In the last days of Lemuria, those who tended the flames upon the altars of the temples were warned of the coming cataclysm. They removed their flames, carried them to places of safety, and deposited those flames in other physical retreats or removed them to the etheric octave. Lord Lanto carried the flame of precipitation and deposited it in the area of the Grand Teton mountains in North America. The flame of precipitation is a Chinese green tinged with yellow of the second ray. This flame burning in the Royal Teton Retreat is the quality in consciousness that makes Americans extremely practical, developing an applied science in technology that takes us back to the time of Mu when that technology even exceeded what we have today. It is a flame of abundance that enables the precipitation of wealth as well as happiness and joy and the Universal Christ consciousness. Quick Prayer: Teach me the way of wisdom and show me how to bring forth my Christ consciousness. Lanto has held the golden flame of illumination on behalf of the Chinese people for many, many centuries. This flame is anchored in China in the retreat of the archangels Jophiel and Christine, which is located in central China. 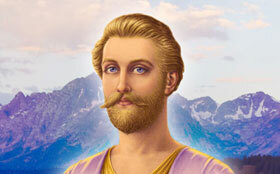 Throughout the nineteenth and twentieth centuries, Lanto has stood faithfully behind the efforts of Saint Germain to liberate mankind through his release of the ascended masters' teachings on the I AM Presence and the violet fire. Blaze Illumination's Flame through us! “Rise to greet the dawn of illumination through Lord Lanto, who holds in his hands the book of the law of life for your soul—for the soul of a planet and a universe. His wisdom is a scroll that never ends; 'tis a scroll whereby you make amends. And in the profound understanding of the Lord of the Second Ray, lo, your sins are washed away!”—Djwal Kul, from the meditation, The Hidden Chamber of the Heart. Read more about Lord Lanto, the second ray and the etheric retreats. The pulsations of that flame of golden illumination are beamed every moment into the world atmosphere, and what we do here is done in every retreat of the Great White Brotherhood. Love is the key to the solution of every problem, love for your Mighty I AM Presence. Stay close to your Mighty I AM Presence and nothing can touch you. Your own Holy Christ Self and your beloved God Presence are eager to have you become the master of your own world that you might be able to see just what is acting there.